We are not necessarily kind to our eyes. Not only do we forget our sunglasses all the time, but we then spend hours upon hours staring at a screen every day. We also get so into our work that we forget to blink, drying our eyes out and burning our corneas. It’s a very real thing. While making sure to blink more while you work can help, trying not to put one focused light in front of your eyes can lessen the damage as well. If you want to minimize the strain of looking at a screen in a darker room, a backlight behind your monitor can help. The Lightpack will do just that, as this a content-driven lighting system that will not only give you more lighting, but will have it be the same color as what’s on the screen. This gives you a tad more indirect lighting, but also broadens what you’re looking at to be more of a visual experience. You won’t need to worry about installing drivers as this will be automatically recognized on the first connection. It will play nicely with Windows, Mac OS, Linux, and Android, connecting through USB to your setup. 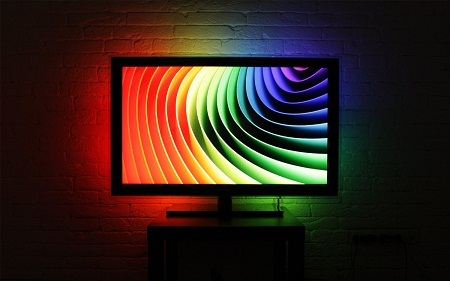 While there are options for screens under 52 inches at $79, there is also a Lightpack for TVs that are 65-86” if you’re wanting the same sort of effect for your living room.